This article is about the administrative region in Greece. For other uses, see Macedonia (disambiguation) and Thrace (disambiguation). "East Macedonia" redirects here. For other uses, see Eastern Macedonia (disambiguation). 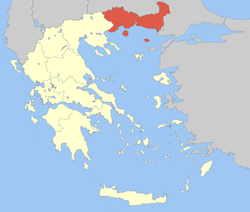 The region of Eastern Macedonia and Thrace was established in the 1987 administrative reform as the Eastern Macedonia and Thrace Region (Greek: Περιφέρεια Ανατολικής Μακεδονίας και Θράκης, Periféreia Anatolikís Makedonías kai Thrákis). With the 2010 Kallikratis plan, its powers and authority were redefined and extended, with the preexisting region in many respects inheriting status and weight of the five now abolished prefectures, Drama, Evros, Kavala, Rhodope and Xanthi. In this special case, the region of Eastern Macedonia and Thrace also succeeds the intermediate structure of the two super-prefectures of Drama-Kavala-Xanthi and of Rhodope-Evros into which the five prefectures had been grouped since 1994. Capital of the region is Komotini, which by population is the fourth largest city, following Alexandroupoli, Kavala and Xanthi. The region is divided into the Macedonian regional units of Drama, Kavala and Thasos and the Thracian regional units of Xanthi, Rhodope and Evros, which coincide with the territory of the former prefectures, except for Thasos, which was part of the Kavala prefecture. Unlike the former prefectures, the regional units however have very limited administrative powers. Along with Central Macedonia, the region is supervised by the Decentralized Administration of Macedonia and Thrace based at Thessaloniki. The political post of the Regional governor (Περιφερειάρχης) was also created in the course of the Kallikratis reform and can be considered the successor of the former prefects. The current governor is Christos Metios, who succeeded in November 2016 deceased Giorgos Pavlidis (Nea Dimokratia). Pavlidis was elected in the 2014 regional election, beating the incumbent first-ever regional governor and former Prefect of Rhodopi, Aris Giannakidis [el] (PASOK), elected in the 2010 regional election. The region is home to Greece's main Muslim minority, made up mainly of Pomaks and Western Thrace Turks, whose presence dates to the Ottoman period. Unlike the Muslims of Greek Macedonia, Epirus, and elsewhere in northern Greece, they were exempted from the Greek-Turkish population exchange following the 1923 Treaty of Lausanne (1923). According to the 1991 census, the Muslim minority numbered around 98,000 people or 29% of the population of Western Thrace, of which about half were Western Thrace Turks and the rest (35%) Pomaks and Muslim Romani people (15%). In the 2014 European elections in Greece, 42,533 people from Eastern Macedonia and Thrace voted for the Party of Friendship, Equality and Peace, which represents what it regards as the Muslim minority in Greece. These Muslim minority populations are completely distinct from the Ottoman-era Greek Muslims, such as the Vallahades of western Greek Macedonia, who were almost entirely expatriated to Turkey as part of the 1923-24 Population exchange between Greece and Turkey. ^ "Demographic and social characteristics of the Resident Population of Greece according to the 2011 Population - Housing Census revision of 20/3/2014" (PDF). Hellenic Statistical Authority. 12 September 2014. Archived from the original (PDF) on 2015-09-08. ^ "Νέος περιφερειάρχης Ανατολικής Μακεδονίας και Θράκης o Χρήστος Μέτιος". iefimerida.gr (in Greek). 30 October 2016. Retrieved 2017-07-19. ^ "Έφυγε από τη ζωή ο Περιφερειάρχης Γιώργος Παυλίδης - Alexpoli.gr". Alexpoli.gr (in Greek). 20 October 2016. Retrieved 2016-10-20. ^ Greek Ministry of Foreign Affairs. "The Muslim Minority of Greek Thrace". Retrieved 2014-06-13. Wikimedia Commons has media related to East Macedonia and Thrace.